The Lower Manitowoc River watershed includes the 168 square mile (436 square kilometers) area of land that extends from the confluence of the North and South branches of the Manitowoc River for 36 miles before entering Lake Michigan at the city of Manitowoc. More than 90 percent of the watershed is within Manitowoc County; the remaining portions lie within Brown and Calumet counties. Land use is primarily agricultural, approximately 67 percent, and about 5 percent is in urban use. The rest is woodland and wetlands, which include the Liberty Swamp and Maple Grove Swamp, both characterized by lowland hardwood species. The watershed also includes the Collins Marsh Wildlife Area, an extremely important aquatic environment. Sewer service area plans are developed under Wisconsin Administrative Code NR 121 for cities, towns, villages etc., with populations exceeding 10,000. Plans are developed to control growth in outlying areas and to protect water quality of streams, wetlands, lakes, and groundwater. The 1990 census reported 32,521 people in city of Manitowoc and an estimated population (by municipality) of 33,761 for 1995 (WDOA 1990). The 1990 census reported 13,030 people in the city of Two Rivers and an estimated population of 13,274 for 1995 (WDOA 1990). There are six municipal point source dischargers and eight industrial point source dischargers in the Lower Manitowoc River Watershed: Clarks Mills Sanitary District, Manitowoc City, Reedsville Village, Rockland Sanitary District No. 1, St. Nazianz Village, Valders Village, Busch Ag. Resources Inc., Holler Lakeside Auto, Imperial Eastman, Lakeside Foods Inc. Manitowoc Plant, Manitowoc Grey Iron Foundry Inc., Manitowoc Public Utilities (two sites) and U.S. Army Corps Engineers/Manitowoc Confined Disposal Facility (CDF). The Lower Manitowoc River Watershed was one of the first five priority watersheds selected under the Wisconsin Nonpoint Source Pollution Abatement Program established in 1978. The project was assumed by the Rural Clean Water Program in 1980. The nonpoint source project was completed in 1993. Many nonpoint source problems still exist in the Lower Manitowoc River Watershed, including groundwater issues that were not addressed in old watershed projects. Since it was one of the first priority watershed projects in the state, many best management practices available to today's projects were not available to improve and protect water quality. New best management practices available today include: rotational grazing, reduced tillage, streambank easements, milkhouse waste management, cattle mounds, barnyard abandonment, and well abandonment. The Lower Manitowoc River Watershed is located primarily within the Central Lake Michigan Coastal Ecological Landscape which stretches from southern Door County west across Green Bay to the Wolf River drainage, then southward in a narrowing strip along the Lake Michigan shore to central Milwaukee County. Owing to the influence of Lake Michigan in the eastern part of this landscape, summers there are cooler, winters warmer, and precipitation levels greater than at locations farther inland. Dolomites and shales underlie the glacial deposits that blanket virtually all of the Central Lake Michigan Coastal Ecological Landscape. The dolomite Niagara Escarpment is the major bedrock feature, running across the entire landscape from northeast to southwest. Series of dolomite cliffs provide critical habitat for rare terrestrial snails, bats, and specialized plants. The primary glacial landforms are ground moraine, outwash, and lakeplain. The topography is generally rolling where the surface is underlain by ground moraine, variable over areas of outwash, and nearly level where lacustrine deposits are present. Important soils include clays, loams, sands, and gravels. Certain landforms, such as sand spits, clay bluffs, beach and dune complexes, and ridge and swale systems, are associated only with the shorelines of Lake Michigan and Green Bay. Historically, most of this landscape was vegetated with mesic hardwood forest composed primarily of sugar maple, basswood, and beech. Hemlock and white pine were locally important, but hemlock was generally restricted to cool moist sites near Lake Michigan. Areas of poorly drained glacial lakeplain supported wet forests of tamarack, white cedar, black ash, red maple, and elm, while the Wolf and Embarrass Rivers flowed through extensive floodplain forests of silver maple, green ash, and swamp white oak. Emergent marshes and wet meadows were common in and adjacent to lower Green Bay, while Lake Michigan shoreline areas featured beaches, dunes, interdunal wetlands, marshes, and highly diverse ridge and swale vegetation. Small patches of prairie and oak savanna were present in the southwestern portion of this landscape. The major concern in this part of the river has been PCB detection. The source of the PCBs has not been detected. Catfish are in the DO NOT EAT category of the consumption advisory due to PCB levels in excess of the health standard. In order to assess the impacts to human health and conduct trend monitoring, Watershed Management (WT) should sample fish in the Manitowoc River above and below the dam at Clarks Mills to determine the source and extent of the problem. Hypolimnetic Nutrient Inactivation: Bullhead Lake, Manitowoc Co. WIS.
Manitowoc Public School District: Manitowoc Public School District Ais Educational Project: The Manitowoc Public School Dist proposes to develop an aquatic invasive species (AIS) education project in conjunction with the Wisconsin Maritime Museum (WMM) and Woodland Dunes Nature Center. The project elements & deliverables are specified in Manitowoc Public School District's AIS Control Grant Application, dated 7.26.06. The project includes providing AIS educational programming linked to public school sixth-grade science curriculum to all sixth grade classes in school year 2007/2008; creating permanent displays at three areas of the Rahr Memorial School Forest; creating one or more AIS informational exhibits at the WMM and developing a funding strategy to sustain the program beyond the grant period. Designs of the displays and exhibits created for this project will be submitted to DNR for approval prior to construction, & copies of the designs will be provided to DNR as part of the project's deliverables. Representatives from the Manitowoc Public School District, WMMand Woodland Dunes Nature Center will meet with a DNR project overview team at the initiation of the project to review its implementation strategy. Quarterly progress reports & a final report summarizing the project will be provided to DNR. If consultant is to provide the final report, it is recommended that the Grantee provide the DNR AIS Coord with a draft for comment on report adequacy prior to making final payment to the consultant. DNR will be provided both paper and electronic .pdf copies of the final report along with, or prior to, submission of grantee's final payment request. If watercraft inspection is conducted as part of the project then those records will be entered into the State's online Watercraft Inspection Database. Any publications produced as part of the project will incorporate the "Stop Aquatic Hitchhikers! "\FFFD brand. Installation Of Barnyard Runoff Controls In Manitowoc County: All livestock barnyards within 300 ft. of streams that flow to Lake Michigan, in Manitowoc Co., with significant pollution ratings will be corrected. Bullhead Lake Advancement Association, Inc: Bullhead Lake Stormwater Catch Basin Study: 1. 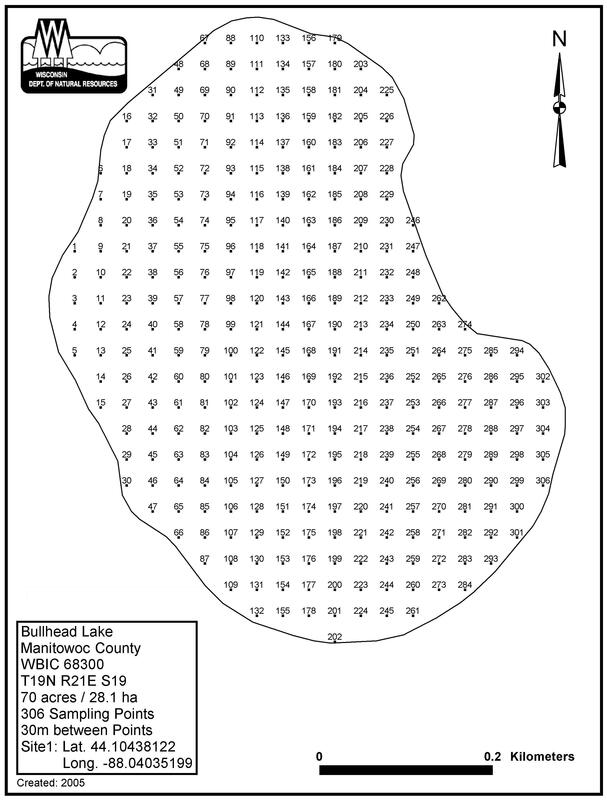 Map the size of the drainage area to the lake's wetland. 2. Define the size of the wetland and its hydrological capacity during either a 10 year or 50 year storm event. 3. Design a diversion of retention area to collect runoff from agricultural land before it enters Bullhead Lake. 4. Prepare a final report including the results of tasks 1-3. 5. Disseminate project results to the public by summary report mailing and local newspaper article. Bullhead Lake Advancement Association, Inc: Bullhead Lake Apm Plan Phase 1: The Bullhead Lake Advancement Association proposes to begin the process of developing an aquatic plant management plan for Bullhead Lake. Specifically, this project will review and summarize existing aquatic plant and water quality data for Bullhead Lake. The Bullhead Advancement Association will initiate discussions with lake users about problems, goal, and objectives for Bullhead Lake's aquatic plant management. A final report and management plan will come after the completion of Phase 2 (Public Participation and Plan Development). 3. **9** Integration of a public involvement process. City Of Manitowoc - Engineering: Utility District Implementation: creation and implementation of a stormwater utility funding mechanism for the City. City Of Manitowoc: Manitowoc River Watershed Education Project: The City of Manitowoc in cooperation with the Wisconsin Maritime Museum proposes to establish a Manitowoc River Watershed citizen stewardship volunteer group. The Museum will host two stream monitoring workshops to train interested volunteers, coordinate youth educational activities including storm drain stenciling, host three watershed educational programs, and develop growth and sustainability of the group and its programs by developing a fund-raising strategy. The project elements and deliverables will be completed as described in the project proposal submitted to the Department and dated April 2006. Lakeshore Natural Resources Partnership Inc.: Lakeshore Nr Partnership "Cultivating Stewardship In The Manty River System": The Lakeshore Natural Resources Partnership, Inc. proposes to supplement and build on previous work by partners to raise public awareness and participation in water stewardship. Specifically, Lakeshore Natural Resources Partnership will focus on building the capacity and membership of the Friends of the Branch River and the Friends of the Pine River groups. Activities for each group includes a water seminar and membership banquet, an explore and restore river event that includes litter clean-up, a paint-out event with the Water\2019s Edge Artists, and a fall and spring newsletter. The overall project goals are to enhance the watershed stewardship groups existing within the project area by building their capacity to reach and engage local citizens and officials, provide citizens and officials with opportunities to participate in protecting and restoring the rivers, and raise citizens\2019 and officials\2019 awareness and understanding of the threats to rivers in the project area. The project elements and deliverables will be completed as described in the project proposal submitted to the Department and dated April 30, 2009. Lakeshore Natural Resources Partnership Inc.: Cultivating Stewardship In Lakeshore Basin: The Lakeshore Natural Resources Partnership, Inc. proposed to supplement and build on previous work by partners to raise public awareness and participation in water stewardship. Specifically, Lakeshore Natural Resources Partnership will focus on building the capacity and membership of the Friends of the Branch River, Friends of the Pine Creek, and Friends of Hika Bay and Centerville Creek groups. Activities for each group includes a water seminar, an explore and restore river event, and a paint-out event with the Water\2019s Edge Artists, and several newsletters and newspaper articles releases. The overall project goals are to enhance the watershed stewardship groups existing within the project area by building their capacity to reach and engage local citizens and officials, provide citizens and officials with opportunities to participate in protecting and restoring the rivers, and raise citizens\2019 and officials\2019 awareness and understanding of the threats to rivers in the project area. The project elements and deliverables will be completed as described in the project proposal submitted to the Department and dated April 30, 2010. Lakeshore Natural Resources Partnership Inc.: Launching Friends Of Manitowoc River Ws: The Lakeshore Natural Resources Partnership, Inc. will build the capacity and membership of the newly forming citizen group calling themselves the Friends of the Manitowoc River Watershed. Specifically, Lakeshore Natural Resources Partnership will develop and implement a membership drive utilizing WaterGrass software, host three water seminars, host at least six explore and restore river events, and conduct outreach by preparing newsletters and newspaper article releases. The project elements and deliverables will be completed as described in the project proposal submitted to the Department and dated April 26, 2012. Lakeshore Natural Resources Partnership Inc.: Friends Of Manitowoc River Watershed: Lakeshore Natural Resources Partnership proposes to continue to build capacity and implement the work plan for the Friends of the Manitowoc River Watershed. Specifically, Lakeshore Natural Resources Partnership will conduct a membership drive, host seminars, workshops, and river events. River events will include river clean-ups, interpretative paddles on the river, Watershed Ambassador Summer Camp, and Project RED training and implementation. The project elements and deliverables will be completed as described in the project proposal submitted to the Department and dated April 27, 2013. Lakeshore Natural Resources Partnership Inc.: Friends Of The Manitowoc River Watershed Action Plan: Lakeshore Natural Resources Partnership (LNRP) is sponsoring a project to support Friends of the Manitowoc River Watershed as the group continues to build appreciation for and stewardship for the Manitowoc River. Project final deliverables include: all data collected, agendas and minutes for planning meetings, presentations, newsletters and educational materials provided to the public. Specific project activities include: 1) Providing care for Lower Schutte Park; 2) Facilitating funding and design of a new kayak launch at the park; 3) Hosting river clean-up event; 4) Conducting a Project RED event; 5) Hosting a Subfest River Paddle event; 6) Mapping invasive species in the Manitowoc and Little Manitowoc Rivers utilizing the AIS bridge Snapshot day protocols; 7) Hosting educational seminars; 8) Hosting Lake Michigan Beach clean-up events; 9) Hosting Watershed Ambassador Camp. This scope summarizes the project detail provided in the application and does not negate tasks/deliverables described therein. Data, records, and reports, including GIS-based maps, and digital images, must be submitted to the Department in a format specified by the regional Rivers Biologist. If consultant is to provide final report, it is recommended that Grantee provide DNR Rivers Coordinator with a draft for comment on report adequacy prior to making final payment to the consultant. DNR to receive both paper and electronic .pdf copies of the final report along with, or prior to submission of grantee's final payment request. Lakeshore Natural Resources Partnership Inc.: Implementing The Lower Manitowoc River Action Plan: Lakeshore Natural Resources Partnership (LNRP) is sponsoring a project to support Friends of the Manitowoc River Watershed as the group continues to build appreciation for and stewardship for the Manitowoc River. Specific project activities include: 1) Providing care for Lower Schutte Park including monthly State of the Park reports and installation of Porta-potties; 2) Hold a Manitowoc River Clean-up event; 3) Conducting a Project RED event on the Manitowoc River; 4) Hosting a Subfest River Paddle educational event; 5) Mapping invasive species in the Manitowoc and Little Manitowoc Rivers utilizing the AIS bridge Snapshot day protocols; 6) Hosting educational seminars; 7) Hosting Lake Michigan Beach clean-up events; 8) Hosting Watershed Ambassador Camp. Lakeshore Natural Resources Partnership Inc.: Implementing The Lower Manitowoc River Action Plan: Lakeshore Natural Resources Partnership (LNRP) is sponsoring a project to support Friends of the Manitowoc River Watershed as the group continues to build appreciation for and stewardship for the Manitowoc River and near shore Lake Michigan ecosystems. Specific project activities include: 1) Hold a Manitowoc River Cleanup event; 2) Conducting a Project RED event on the Manitowoc River; 3) Hosting three River Paddle educational events; 4) AIS Snap Shot Day mapping event along the Manitowoc and Little Manitowoc Rivers; 5) Hosting educational seminars; 6) Hosting two Lake Michigan Beach clean-up events; 7) Support the B-Wet Watershed Experiences educational curriculum. Lakeshore Natural Resources Partnership (LNRP) is sponsoring a project to support Friends of the Manitowoc River Watershed as the group continues to build appreciation for and stewardship for the Manitowoc River and near shore Lake Michigan ecosystems. Project final deliverables include: all data collected, agendas and minutes for planning meetings, presentations, newsletters and educational materials provided to the public. Specific project activities include: 1) Hold a Manitowoc River Cleanup event; 2) Conducting a Project RED event on the Manitowoc River; 3) Hosting three River Paddle educational events; 4) AIS Snap Shot Day mapping event along the Manitowoc and Little Manitowoc Rivers; 5) Hosting educational seminars; 6) Hosting two Lake Michigan Beach clean-up events; 7) Support the B-Wet Watershed Experiences educational curriculum. Lakeshore Natural Resources Partnership (LNRP) is sponsoring a project to support Friends of the Manitowoc River Watershed as the group continues to build appreciation for and stewardship for the Manitowoc River. Project final deliverables include: all data collected, agendas and minutes for planning meetings, presentations, newsletters and educational materials provided to the public. Specific project activities include: 1) Providing care for Lower Schutte Park including monthly State of the Park reports and installation of Porta-potties; 2) Hold a Manitowoc River Clean-up event; 3) Conducting a Project RED event on the Manitowoc River; 4) Hosting a Subfest River Paddle educational event; 5) Mapping invasive species in the Manitowoc and Little Manitowoc Rivers utilizing the AIS bridge Snapshot day protocols; 6) Hosting educational seminars; 7) Hosting Lake Michigan Beach clean-up events; 8) Hosting Watershed Ambassador Camp. All livestock barnyards within 300 ft. of streams that flow to Lake Michigan, in Manitowoc Co., with significant pollution ratings will be corrected. The Village of Valders is located within the Lower Manitowoc River watershed. Valders was settled in the 1850s by immigrants from the Valdres mountainous region of Norway, who were unable to eke out a living on their rocky hillside farms. The arrival of the railroad in 1896 allowed the community to grow, and it was incorporated into a village in 1921. As the village was founded by Norwegians, it was natural that the first churches were Lutheran: Valders Lutheran parish, Our Savior Lutheran parish, and Gjerpin Lutheran parish. These were later combined into Faith Lutheran parish (ELCA). There is also a small Protestant Conference parish. After the arrival of the railroad, many German settlers moved in who were primarily Catholic, but no parish was developed for them. To this day, there is still a significant population of Catholics, who worship at St. Gregory in St. Nazianz to the south, St. Mary of the Immaculate Conception in Clarks Mills to the north or St. Thomas the Apostle in Newton to the east. Valders is known within the state for its dolomitic limestone quarry, which produces building rock, harbor rock and gravel. Gray Woodfordian Drift soil is also described as Valderan Drift. The Valders lobe glacial advance was named after the village.